Today I went out and got some lovely photos of the early spring blossoms. Warning, this post contains many high-res photos. There’s not a whole lot blooming, but there’s some. We’re still a long while away from the violets, dandelions and asters that flood my lawn in late summer and fall. It’s really nice to see all the life starting to creep back into the world, though. And these early flowers can be a lifesaver for bees, especially wild ones. Daffodils are considered one of the best early flowers for pollinators. I even took a few shots of the tree out front of my house. The same one you saw weighed down under snow in my last post. The lovely pink blossoms are just about on their way out. After much digging I have finally identified this mystery tree outside my house as am ornamental plum tree, either a cherry plum or purple leaf plum. Both have edible fruits in the late summer to early fall ideal for making jams. I had NO idea that this was the case, and perhaps I shall have the opportunity to taste them this year. I have my pectin and jelly jars all ready! Also on the list of “things I didn’t know” are these gorgeous pink flowers that produced for me one whole apple last year. I was shocked. When I saw it, I thought it was some sort of bug’s nest hanging on a branch. I have NEVER seen this plant do anything before, but I knew it was in the rose family and given that it never produced a fruit, I assumed it was a rose bush, not a fruit tree. But apparently it’s an APPLE shrub! Who knew!? Maybe we will get more apples from it some day. I would like to try to graft some branches onto it from other very-early blooming apple trees and see if I can get a real apple crop! I shall be trimming it down aggressively this year, along with the plum tree. They both need a serious pruning. Even our Magnolia is in bloom, though it’s flowers aren’t quite so useful. They don’t even feed bees, and the tree is a mess. It’s my least favorite plant on my property. It can be hard to photograph in the wind. Pretty much all of these plants were put in by the people who owned this house before the people who owned this house before us. Apparently they were a couple of old retired ladies who loved to garden. I find myself in need of upping my game. The plants they chose are generally lovely, but I want to grow flowers too! Specifically bee flowers. You may recall some of my previous posts about gardening, especially for bees, wherein I attempted to grow some bee-friendly flowering plants to ultimately end in epic failure as they were dug up by my chickens escaping the confines of their chicken pen. Well this year, I thought I’d try again. I invested $20 in a mixed shade perennial package from Costco, same as last time. It came with five hostas, five astibles and five crimson star columbines. These are all big bee attractant plants that bloom from early to late summer. And so far, things are going OK. The plants came in plastic bags which I immediately opened, tried to sort them into generally upright positions, and then watered heavily. Recently I repotted them. Since then, the columbines have done squat nothing, they may indeed be dead completely on three of them. But the astibles and hostas are doing MUCH better! Two of the astibles, separated and growing nicely. In addition to these I also purchased a pair of lilac bushes that were similarly sad and pathetic upon arrival. Lilacs are good for butterflies, and sub-par for bees, but they are my favorite flowers, and all pollinators need food, including butterflies. They have since perked up significantly and nearly doubled in size. Lilacs in their new kitchen-side window home! And lastly, I also did some homesteading things while I was outside today. I started by pruning and separating some blackberry canes that were starting to overgrow. Then I weeded the strawberry bed. The weeds were then tossed right back into the bed, root side up, to produce mulch for the strawberries. It may not look like much but the nine plants we put in last year have multiplied into a couple dozen. Depending on how well they do, some of them might be dug up, washed, and repotted for some vertical gardening I would like to do. And with the advent of freshly disturbed mulch, dirt and plant, the chickens attempted to lend a beak to the process. Chickens, invading the strawberry bed. The string to designate the area off limits to the dogs means nothing to the chickens. So they were given a handful of wheat berries that we use to grow fodder on occasion, away from the strawberries, which kept them distracted until nightfall. Making today a warm, beautiful, and otherwise rewarding day. I just still wish that the REST of my lawn wasn’t quite a swamp, so I could get right down to gardening. This weather would have been perfect for it! So I have been wanting to keep bees for some time. And every time I speak of this to anyone they think I am crazy. Completely nutsy. You see, I am terrified of bees and have been my whole life. But I love honey and so I have been working hard at getting used to bees so I can keep a beehive. Just a small one that I can harvest one pint of honey from each year, more on good years to give as Christmas gifts or some such. Recently we have these tiny white daisy-like flowers all over these shrubby plants in my back yard. I don’t mow my back yard or weed much because I want to know and lean about all of the native plants that are growing. These little shrubby things, covered in tiny, dime to quarter sized white flowers, are bee heaven. They are always COVERED in dozens of tiny bumble bees and lots of native, wild honey bees as well. And because I like the idea of feeding and encouraging local pollinators, I have had to work right through them, moving chicken tractors, dishing up feed and delivering water as the swarm around me. 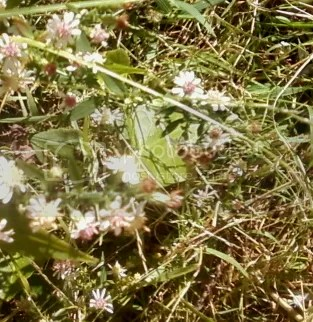 The honey bee in this shot is very hard to see, but it was the best picture I could get with my phone. All in all this has made me feel much more confident of having a hive of my own. And I have been having this issue of what to do with the whole entirety of my front lawn. That’s over 1000 square feet of space I just haven’t been using because of deer, squirrels, rabbits, chipmunks, etc. that needs to be mowed every few weeks. Bleh. So I have decided to plant a bee garden. Over my entire front lawn. The front lawn will be nothing but flowers both beautiful and useful so I will both feed my bees and never have to mow again. I will even be employing clover as a cover crop and native plants so that I won’t have to weed! The bee garden will be made up of lots of flowers good for bees and butterflies, but many of which may be toxic to other wildlife, such as the local posse of deer that live across the street. In this way the animals SHOULD avoid my lawn in general (seeing as there’s things like delicious daylilies just across the street) and the toxic plants have a chance of protecting the less toxic plants. The result? My front lawn space has a chance of being useful! Many of these plants have some sort of use on the homestead or are edible. Goldenrod, Deadnettle, Echinachea, chamomile, honeysuckle… All very tasty! Goldenseal is a powerful herbal medicine. Sunflower seeds are an amazing snack for my chickens! Bee balm is a unique spice sometimes used like Oregano. Bearded irises are some of my favorite smelling flowers. My hope is to get some good spices out of my front lawn, some medicinal herbs, some edible seeds, and maybe even some Honeysuckle berries for jams! All the while feeding local bee populations and making my front lawn thick with the sticky sweet smell of flowers. My bee garden will take some serious tweaking to get flowers blooming in every season all the time, but it will get there! I will work on pairing up plants that do well together and making sure that when one plant dies out, another can take it’s place! If you have any perennial suggestions of flower, shrubs, bushes or ground cover for my bee garden I’d love to hear them! In the meantime… It’s time to start finding garden bed edging!